Rev. Frank Julian is a BSN prepared RN, retired after 40 years of experience. He has been a pastor for 33 years. Presently, He is the senior pastor of Faith Christian Assembly, a large, diversified urban church located in Melvindale, Michigan. His college sweetheart and wife of 40 years, Peggy, is also a nurse. Angela, his daughter, is a Chemical Engineer with the Ford Motor Company and Frankie, his son, is a doctor of pharmacy. He has 2 grandsons and and 2 granddaughters. He is known as a loving pastor with a pure heart for God. His love and caring for people merged his duel calling of nursing and ministry, on his first trip to Africa. Rev. Frank’s passion for AIDS relief began when he stuck his finger with a “dirty needle” in 1988 at the height of the AIDS scare in America, while performing screening tests. The fear of infecting his wife and leaving his children orphaned tormented him. Fortunately he wasn’t infected, but his identification with the disease was established and on his first trip to Africa in 2001 he was confronted firsthand with the AIDS epidemic. He was asked to send Ensure, liquid nutrition to help AIDS victims battle the disease. 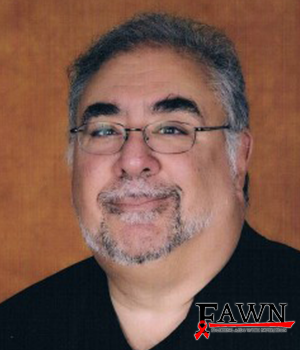 He started FAWN: Fighting AIDS with Nutrition. Now, 17 years and 5 trips later, about 50 shipments of over 200,000 cans have been sent to Haiti and many nations in Africa. Pastor Frank has been covered by the local media in television features, radio interviews and many local newspaper articles. 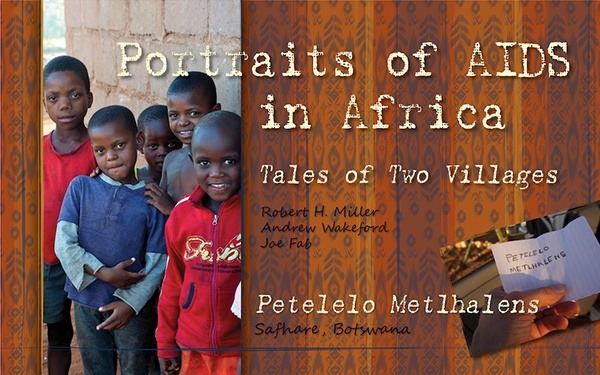 He has spoken in many venues on the subject of AIDS in Africa and FAWN. He is the recipient of a humanitarian awards and has been featured in the Grand Valley State University Nursing Magazine, where he graduated from in 1977. His most identifying feature is his smile. His claim to fame is winning the McDonald’s Smiling Contest Award in 2000. He smiled for 7 hours and 43 minutes winning $10,000. 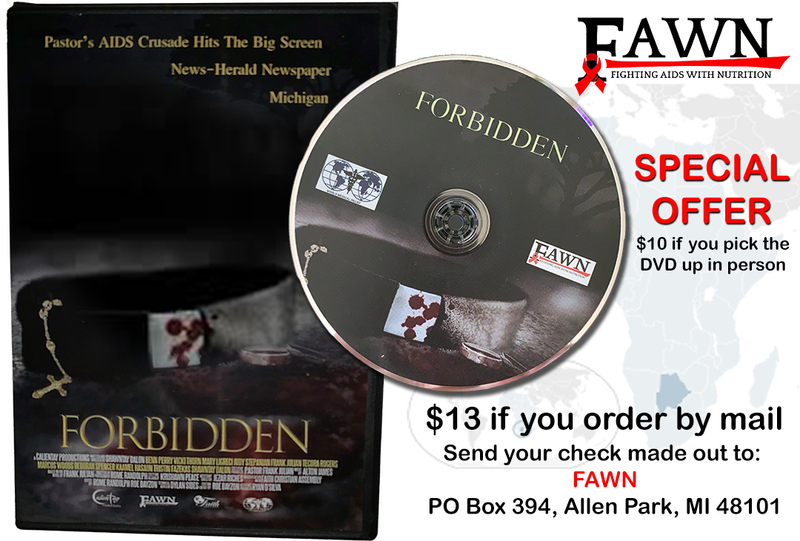 He recently was executive producer of the movie, “Forbidden” with a emphasis on FAWN. 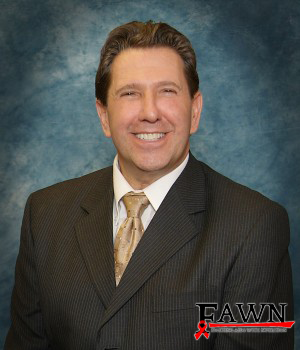 Greg Baise was appointed to the FAWN Board of Directors in January, 2013. He has lifelong experience in serving his community, including acting as a volunteer pharmacist at Cabrini Clinic since 2005. Greg currently works as a community pharmacist and as a pharmacist consultant. Along the way he has also worked as a consultant for the State of Michigan Department of Community Health HIV/AIDS Drug Assistance Program, as well as Salvation Army Harbor Light. Greg received a Bachelor of Science degree in psychology from Wayne State University where he graduated Phi Beta Kappa, and later a Bachelor of Science degree in pharmacy also from Wayne State University. Professionally he received the Wayne County Pharmacists Association (WCPA) Roland T. Lakey Award for outstanding contribution to the Association and the WCPA Gordon Goyette Humanitarian Award for outstanding involvement in community services. He has been a WCPA Board Member and a Michigan Pharmacists Association House of Delegates representative for the local association since 2005. In 2012, Greg was the Recipient of the Michigan Pharmacists Association Bowl of Hygeia Award, a national award given by the State, for Outstanding Community Service. Greg Baise is an active member of St John Armenian Orthodox Church of Greater Detroit located in Southfield Michigan where he is a member of the church Usher Corps, Nominating Committee, member of their Men’s Society, past-chairman of the Church Habitat for Humanity Partnership, and Chairman of the annual Free Health Fair held at the church that targets the entire surrounding community as well as its parishioners. Greg and his wife Edith are very active in the life of their church community. Indeed, it is Edith who organizes an annual Michigan Blood, blood drive that runs in conjunction with the health fair. Greg and his wife Edith also conduct a quarterly “Service Day” for World Medical Relief (WMR). At each service day, parishioners from St Johns are able to volunteer their time sorting medical goods at WMR that will be sent all over the world to meet the medical needs of those less fortunate. Greg and Edith, have three wonderful children and five terrific grandchildren. Greg feels that he has also been blessed with a “second family”, that of belonging to the family that he feels he joined through his volunteer work and being part of the Most Holy Trinity-Cabrini Clinic Family. In 2013 Greg was a recipient of the Most Holy Trinity Annual Good Samaritan Award for his service to Cabrini Clinic at which time, he was also recognized by the Governor of Michigan for his good works. 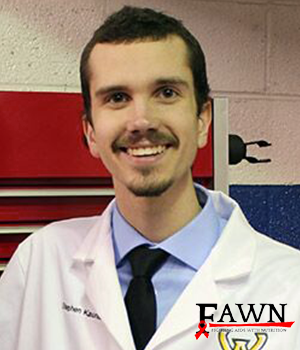 Stephen Kaurala is a graduate of Wayne State University where he earned his Doctor of Pharmacy degree in 2016. During his time at Wayne State University he was one of the founding members of the Fighting Aids with Nutrition chapter at the Eugene Applebaum College of Pharmacy and Health Sciences. Stephen helped to coordinate events for the chapter and to help raise money to purchase cans of liquid nutrition. After graduating, he went on to complete two years of residency in which he specialized in oncology but his passion to help those with HIV/AIDS never left him. Stephen is now practicing at McLaren Oakland where he is helping to develop the new inpatient oncology unit in affiliation with the Karmanos Cancer Institute. When not at work, Stephen enjoys spending time with family and friends. 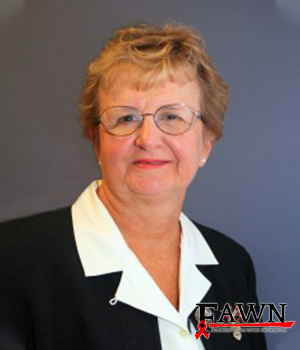 Geralynn B. Smith, Professor Emerita, Wayne State University has been involved with FAWN since 2009. Initially by encouraging second year-student pharmacists to get involved with FAWN by sponsoring a “Liquid Nutrition Can Drive” as a community service project; from 2011- 2018 as a member of the FAWN Board of Trustees and serving as secretary for 4 years; and currently as the Chair of the FAWN Academic Leadership Scholarship in Memory of Richard L. Slaughter for WSU student pharmacists and liaison to the WSU FAWN student chapter. Geri is a pharmacist by profession, spending the last 20 years of her career at Wayne State University (WSU) as a faculty member in the Pharmacy program at Eugene Applebaum College of Pharmacy and Health Sciences (EACPHS). She obtained her baccalaureate degree in Pharmacy from Rutgers – The State University of New Jersey and her Master’s degree from St. John’s University in New York. Geri practiced in hospital, community, and ambulatory care pharmacy settings prior to assuming her position at WSU. At WSU, Geri served as the Director of Experiential Education and maintained an academic role in teaching. Geri was recognized nationally as leader in experiential pharmacy education having been involved in the transition of the pharmacy curriculum from a baccalaureate program to the entry-level Doctor of Pharmacy degree. In 2005, she developed a 3-semester course sequence for second-year student pharmacists to promote their professional growth and develop their understanding of the value of community engagement. The “Liquid Nutrition Can Drive “for FAWN was a requirement for the course. Geri has been recognized by several organizations for her dedication to student development and service to the community. She was the first recipient the EACPHS Prism Prize in 2008. This award was established to recognize members of the college faculty who exemplify the principles of service learning and its impact on faculty, students, and community. In 2016, she was awarded Bowl of Hygeia by the Michigan Pharmacists Association. Other recognitions were by World Medical Relief with their Achievement Award, the SMSHP Community Service Award from the Southeastern Michigan Society of Health Systems Pharmacists and the John H Webster Award by the Wayne County Pharmacists Association. In retirement, Geri continues to be involved professionally by serving as a faculty advisor for the Diabetes Wellness Clinic (D.E.W.) at WSU and as a member for the Oakland County Pharmacists Associations (OCPA), FAWN and Lambda Kappa Sigma (LKS), Omicron Alumni Chapter. With her passion for assisting student pharmacists, Geri has assisted these organizations in developing scholarships to be annually awarded. Geri and her husband, Alan have endowed scholarships for students at WSU Eugene Applebaum College of Pharmacy and Health Sciences, Detroit, Michigan and Walsh University, North Canton, Ohio. In her leisure time, Geri enjoys participating in water aerobics, reading, gardening, going to the theater, and spending her winters in Florida with her husband, Alan. "FAWN is committed to educating all people on the horrific impact of the AIDS epidemic in Sub-Saharan Africa, and to lead all to a place of compassionate action. One of the means for doing this is by hosting a presentation and discussion on the subject with a FAWN representative at your group, organization, or class meeting"